Opening Reception – Saturday, February 7th, 2009 from 6pm – 9pm. Beats by DJ Phyz Ed and Live Printing by Two Rabbits. Description: In the Graffiti subculture, practitioners are known as “writers” because graffiti is about writing your name on as many surfaces as possible. Although many writers elevate their art form to the level of creating huge and beautiful murals, they all began their journey as an artist by first learning to write and perfect their name. The Sharpie marker is often the first tool a writer acquires in his lifelong journey to hone his craft and in becoming an artist. 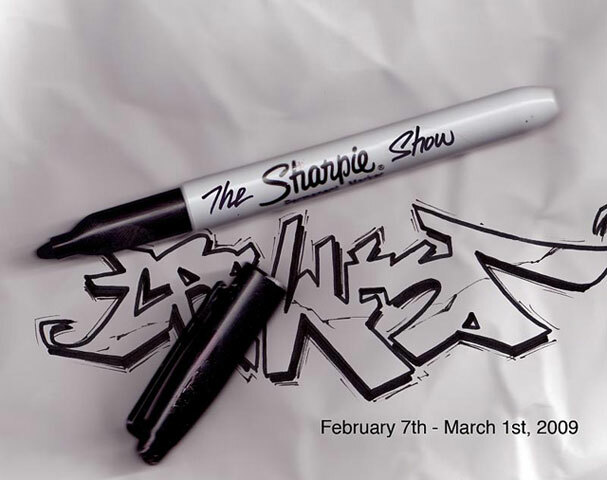 The Sharpie Show, an exhibition curated by renown graffiti artist Man One, featuring original pieces created using Sharpies by some of the best known graffiti artists in the country (and beyond). Aside from graffiti artists, work by tattoo artists and known illustrators; Lalo Alcaraz and Overton Loyd will be on display. From stylized hand signatures, to throw ups, piecebooks, stickers, and any other possible object that can be marked upon, this exhibit will demonstrate the level of creativity that can be achieved between an artist and his/her most basic tool – The Sharpie. Complete Artist Bios available upon request. Crewest is a gallery that supports some of the most talented underground artists from the West Coast and beyond. The gallery’s focus is on urban & graffiti art created through painting, sculpture, digital, and print medias. All of the exhibits housed at Crewest deal with what is current, and significant within the realm of the urban art experience. Hours of operation are Tues. thru Thurs. : noon – 7pm, Fri. and Sat. : 12pm -8pm, Sun. : Noon – 6pm and Closed Mondays (except by appointment only). Man One is a Los Angeles based Latino urban graffiti artist whose professional career has spanned over 15 years with community projects, exhibitions, videos, festivals and corporate commissions worldwide. “Art keeps me alive and it helps me communicate globally about certain issues with massive amounts of people. Graffiti art is a legitimate expression in color, style and purpose. I find inspiration often when I can help the youth of America find a purpose in lieu of their damaging environments,” says Man One.